PARAÑAQUE—Not too many mixed martial arts fans may have heard the name Bi Nguyen. But people who religiously follow the reality show Survivor can recognize her quickly. The 29-year-old Vietnamese-American fighter participated in the American franchise's previous season, David vs. Goliath, one of only two athletes, the other being pro wrestler John Hennigan, in the cast. But now, she has just joined Asia's biggest MMA promotion, One Championship. "It feels amazing. The energy is so different," Nguyen, who last fought under King of the Cage, told Dugout Philippines on Tuesday at the press conference for One: Roots of Honor at the City of Dreams Grand Ballroom. Right now, the concern for her is her right knee. Her stint in Survivor was cut short after just 10 days as she had to leave the game due to an injury she got while in a team challenge her group, known as the David Tribe, eventually won. "Before I went on Survivor, I tore my MCL (medial collateral ligament). A couple of months later, when I was on Survivor, I sprained it," Nguyen revealed the history of her injured knee. The sprain may have had a factor in her previous fight, a submission loss to Jayme Hinshaw for the KOTC women's atomweight title on July 22 (Philippine Time), three and a half months after she begged off from continuing her Survivor game. But following a successful rehabilitation, she insisted, "My knee is good. It's very strong right now. I haven't had any problems the whole camp." 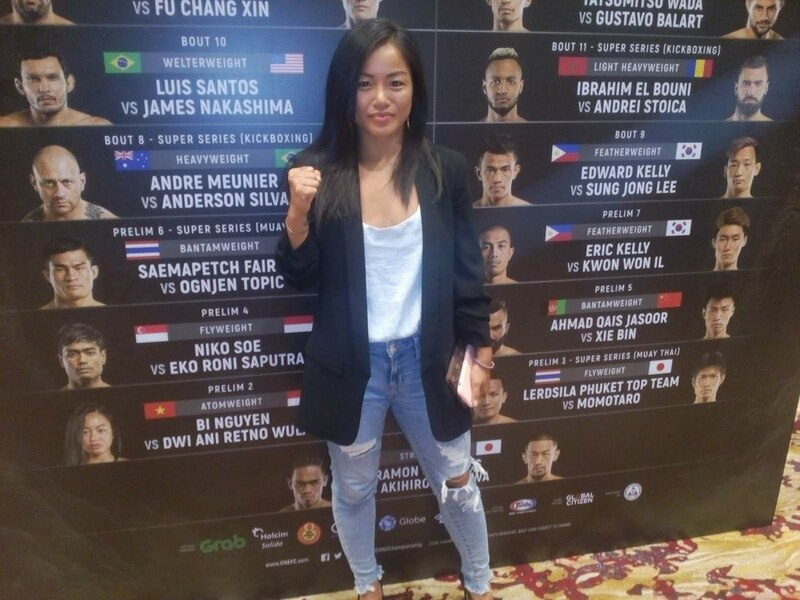 A year after her Survivor stint—four months after formally signing with One—Nguyen will make her debut at One at the Roots of Honor card at the Mall of Asia Arena in Pasay, taking on Indonesian opponent Dwi Ani Wulan. When the fight was officially booked, among the first people Nguyen spilled the beans with is one of her fellow contestants at Survivor: David vs. Goliath, Filipino-American Gabby Pascuzzi. "She was just excited that I was coming to Manila," Nguyen said about the reaction of Pascuzzi, who was also with her tribe during the preliminary phase of the Survivor game. But Nguyen already has some knowledge of the Filipinos pre-Survivor. "I actually love the Filipino culture and the people. I studied Tagalog in high school. I speak Tagalog a little bit," said the native of San Francisco, known for having a huge Filipino community. Looking forward to her match against Wulan, the former world title challenger said, "I just want to win in a dominant fashion to prove that Chatri [Sityodtong] made a great decision by signing me and I'm on the level of the best."